Which U.S. housing market is the most expensive? It seems like the question should have a single, straightforward answer. But with varying definitions of what constitutes a housing market and with different ways of measuring home value, the question is not so clear cut. 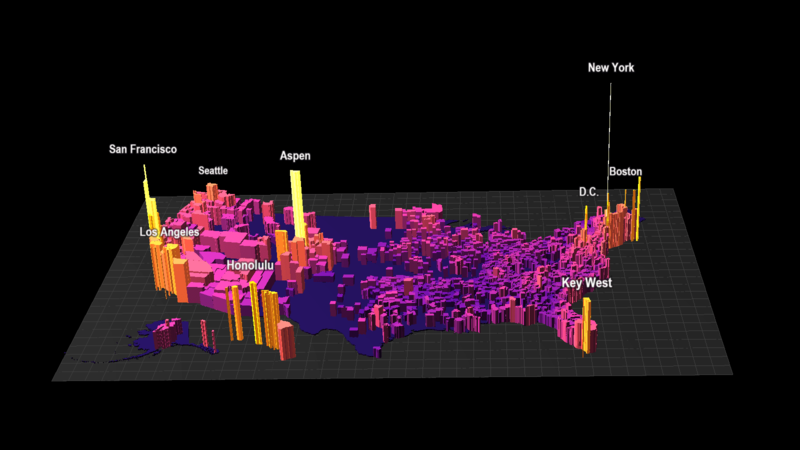 Using data from Zillow, this 3D map shows the cost of housing by U.S. county. The height of each area represents the average price per square foot of its homes. Three light colored areas stand out clearly above the rest. The one in the middle is Aspen (Pitkin County). The other two should come as no surprise: New York City and San Francisco. If you search around online, chances are most reports you find will rank San Francisco as the city with the most expensive homes, followed by New York. And Zillow’s data agrees. The $878 average price per square foot in San Francisco is far higher than New York City’s $422. But that comparison is based on the cities’ arbitrarily-defined boundaries, not exactly an apples-to-apples comparison. New York covers a much larger area than San Francisco and its population is 10x larger (8 million vs 800k). If instead of looking at San Francisco, you compare New York City to the Bay Area, which has roughly the same population, the comparison becomes more interesting. In contrast, the Bay Area appears as a large block of yellow. 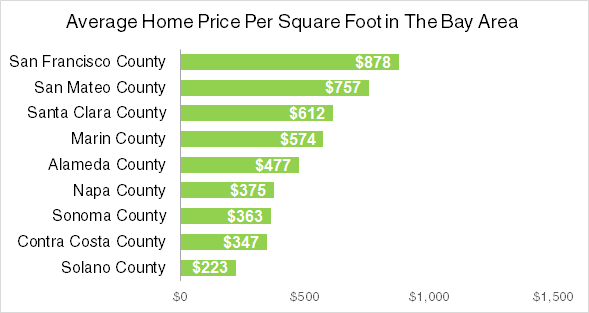 The price per square foot in San Francisco (the highest yellow point in the west) doesn’t match Manhattan, but as you move into the neighboring counties of San Mateo / Santa Clara / Marin, the cost of housing is only marginally lower. So, which area has the more expensive real estate? It seems, the unsatisfying answer is: it depends. If you’re looking to buy a home in the city center, you’re likely to get more for your money in the Bay Area. Manhattan is substantially more expensive per square foot than San Francisco. But, as highlighted in this post by my friend Constantine Valhouli of Neighborhood X, if you’re OK with a bit of a commute, you don’t have to go too far from New York’s center city to find a reasonably priced neighborhood. On the other hand, if you’re searching for a reasonably priced home with a short commute in the Bay Area, you might be looking for a long time. Edit: Previously, the prices per square foot shown in the map were those of recent home sales. They have been updated to instead reflect the ZHVI Median Home Values. My latest project, Blueshift, is an easy-to-use tool for creating dynamic maps, like the one in this post. If you’d like to give Blueshift a try, you can find more information here. You should check the source before calling the data out as being wrong. You’re talking about Houston County, which bears no relation to Houston the city. Houston the city is located in Harris County. ok, I see why..and where is Harris County on this map? I couldn’t find it. If you don’t have the biggest cities on the map..again same result. This is essentially useless unless you factor in income levels. It is a very good map. What is the license type of this html/JS code ? Can I modify it and make the similar map for my country (Taiwan) ? Thanks! It’s BSD license, so you are welcome to modify. Though the data file is something I threw together ad hoc, so it may not make a lot of sense. Hello! I can’t seem to get this map to work, could you help me out with this? 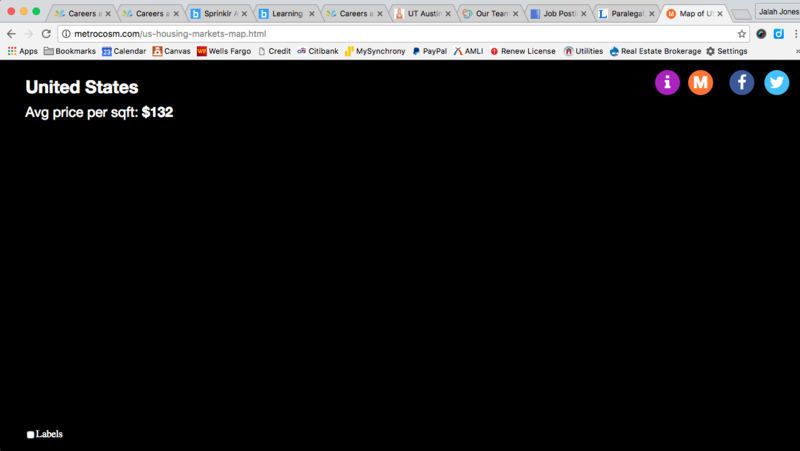 Looks like your browser does not support WebGL. If you are on Safari 6 or higher, WebGL is there, you just have to enable it. Max, you’re great! thanks for you help and hardwork with such data! This is really cool…It might be neat to map the rising costs of homes to see which area gets more expensive over time. So many cities have actually changed, for example many people leave the Bay Area to places like Portland and Austin and as a result the home prices there have become significantly more expensive. How much and how fast would be neat to visualize. Good suggestion. Zillow’s data actually goes back several years. Might not be that hard to add in.